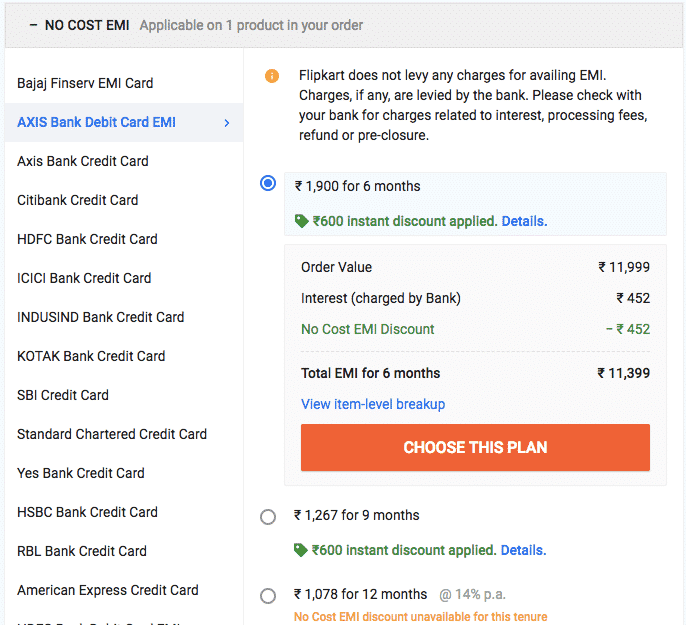 You can buy high value items from Axis Debit Card from Flipkart, minimum cart value with single item should be Rs 8,000 and maximum limit is Rs 1,00,000. No need for any security deposit or down payment. Your pre-approved limit will be decided by Axis Bank as per your performance. No documentation needed to get pre approved emi on Axis Bank Debit card. How to buy using Axis debit card EMI ? You need to Send SMS from registered mobile number in below formate. You will get SMS about your approved limit loan on your debit card. In SMS you will also get Merchant name and validity of this approved limit. You can easily buy on debit card EMI following below step-by-step guide. Other option is to check on the here page. Go to the checkout with One item only which is eligible. Enter Card Details and Proceed further. Follow steps of Debit card and OTP. We will add more detailed steps Subscribe to our email news letter and deliver to your inbox. Below is the example of interest rates for Axix Debit card with Item price of Rs 11,999 as there is offer on No Cost EMI and 5% Discount with Debit Card as well till 10th September 2018. 3,6 and 9 month emi with 14% interest. If you have any questions comments please add below in comment box.